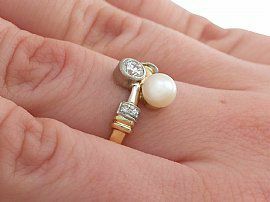 This fine and impressive pearl and diamond ring has been crafted in 18 ct yellow gold with an 18 ct white gold setting. The twist design frame is ornamented with an 18 ct yellow gold set6mm cultured pearl and a 18 ct white gold collet set 0.28 ct transitional modern brilliant round cut diamond, displayed vertically on a twit. The central arrangement is flanked on either side by a lobed cuff design, each embellished with two pavé set eight0cut diamonds. 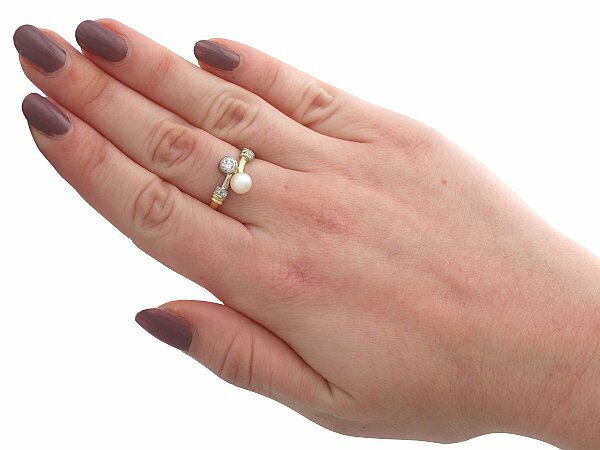 The shoulders meet the cuff designs and blend seamlessly with the plain hallmarked 18 ct yellow gold ring shank. 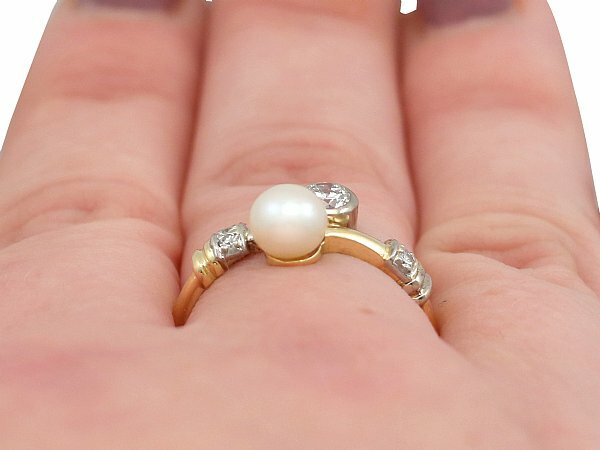 This vintage 1950’s twist ring is supplied with an independent diamond grading certificate for the feature diamond in addition to an independent diamond grading report card for the supporting pearl and diamonds. This impressive vintage dress ring is fine quality set with a cultured pearl and very well colour matched, very high colour graded old cut diamonds.